As I've first traveled in Mexico the landscape often seems a bit alien, the cactus along the highway unusual, especially when adorned with the ubiquitous wind-driven plastic shopping bags. Plastic bags get hooked on trees in Central Park, no reason why Texas and Mexico should be any different. Still, the flora is different and the landscape alien to my eye. The experience reminds me of one years ago when I went out to Edwards Air Force Base on the Mojave Desert in California to cover the landing of Space Shuttle Mission 54. Then, as now, at first my eye was indifferent, even put off by the landscape, but within a few days my eye adjusted and Iwas able to recognize and appreciate the beauty of the light and the form of the plants set upon the desert floor. So it is in Mexico. Today I went to el Charco del Ingenio, a botanical garden and conservatory of Mexican plants set atop a splendid canyon overlooking a 19th century reservoir in which artificial islands have been created to attract and provide habitat for native wildlife and migrating birds—some 130 species have been recognized. Across the small lagoon, known as Las Colonias reservoir, stands a colonial aquaduct and the ruins of an ancient watermill. Near-in, lies a restored wetland area recreated using native and introduced species of plants to create an unusual (for this semi-arid chaparral area) wetland eco-system supporting some unique life forms. Above the reservoir is a cleverly designed windmill, a simple machine modified from a design invented in the 1922 by Finnish designer S.J. Savonius, The Savonius wind mill is a vertical axis wind machine the impeller of which often utilizes 55 gallon oil drums split lengthwise to form an S shape, each half-drum catching the wind to draw water or grind grain. Savonius turbines are not the most efficient wind-driven machines, but they are frequently used in areas whenever cost or reliability is much more important than efficiency. Off the road from San Miguel to Delores Hildago, in the village of Atotonilco is an amazing 18th century church plain on the outside, but vividly decorated inside with crudely carved statures of Jesus and saints, the walls painted with poems, and frescoed walls and arched ceilings of the main altar and several side chapels. The church is in poor repair, needing some serious restoration, which may happen as it's listed as a World Heritage site by the United Nations. Unlike European and First World religious monuments, this church is humble and rustic. But impressive craftsmanship is evident, even with the flooring in the main entrance and chapel, a sort of hand-crafted parquet floor. I've read that this church was on the route of the insurgent priest Fra. Miguel Hildago of Delores in his 1810 midnight rising for independence. So, in its day it must have been an important regional institution. Alas, no flash photography was permitted the day I visited, despite the fact that I was the only one there. Outside sat several elderly women, begging. Near the entrance was a woman sitting with what looked like a young man with cerebral palsy, or some such disability. To her I gave a some pesos, wondering as I did if I should give all of them the same. I'm told the elderly of Mexico suffer because there is no retirement, social security or equivalent social safety net for those too old or otherwise unable to work. It presents a dilemma. Should I give to beggars because, all things being relative, I have money to give? Or, as a woman I met traveling in Mexico for seven years said, does it just encourage a dependence on foreigner's generosity? She said she never gives money to children just for that reason, but does often give to elderly women. Unlike the beggars along the border areas, it seems the outstretched hands of old women outside churches come from genuine need. The gringo woman told me she thinks the Mexican government needs to address the social needs of its people, including the handicapped and elderly and giving to beggars simply delays that inevitability. I wonder and give: sometimes. The dilemma I experience is no different than that I felt in New York city. Give, because I can afford to? Or not give, for fear of being scammed by a fraudulent player. 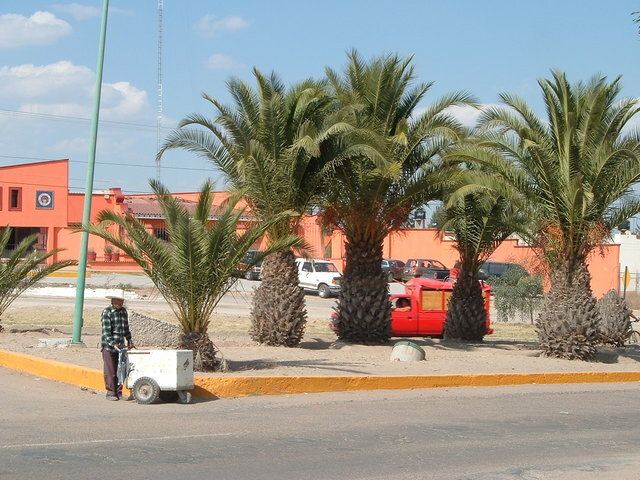 Often, when visitors to San Miguel tell of their experience there I've heard about the nearby Delores Hidago, a smaller city, population just over 50,000 which is known in Mexico as the cradle of national independence. In 1810 a wayward priest, Miguel Hidalgo y Costilla led a rising against Spanish colonial rule on September 15. His leadership and the speech he delivered after ringing the village church bell at midnight ignited the 11-year war of independence. Hildago didn't live to see Mexico liberated from Spanish rule, he was captured a few years after his declaration and his head was delivered on a pike to be displayed in the public square as a warning to others who might carry on the struggle for independence. Several did who were also from this small town, known even today as Insurgentes. Today, Delores Hildago, aside from its historic place in Mexican history is renowned for its pottery, crafted by artisans with a worldwide reputation. Talavera is especially prized by collectors because of its exquisite and colorful glaze. In public institutions, like the Insituto Allende, and in private homes built by Anglos in San Miguel it is common to see bathrooms decorated with Talavera tiles and wash basins. The first floor men's room at the Instituo Allende has side-by-side basins that at first glance took my breath away. One had a rainbow trout curled around the side of the basin, in a green background that was just breathtakingly beautiful. Other designs in bright colors include calla lilies, geometric patterns of blue and gold, and, sometimes, plain, but bright gold or cobalt blue. 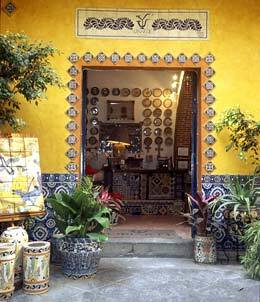 Beside kitchen and bath tiles, Talavera potters make dishes, planters, large standing covered jugs, and many other decorative items. In the Plaza Principal in Delores Hidalgo, a busy little city, stands a huge statue honoring Miguel Hidalgo and other revolutionary heroes. 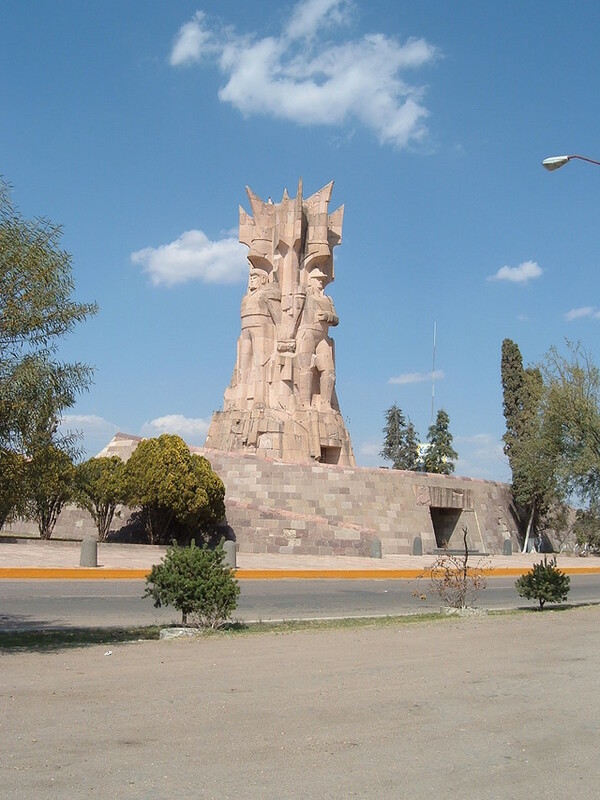 It is a monumental stone sculpture wrought from stone in an obvious Mexican style—hard to explain, but easily recognizable as Mexican by its design and special use of native natural materials. I have seen other examples of clever and appealing design by Mexicans, built by craftsmen accustomed to using materials at hand, often recycled. 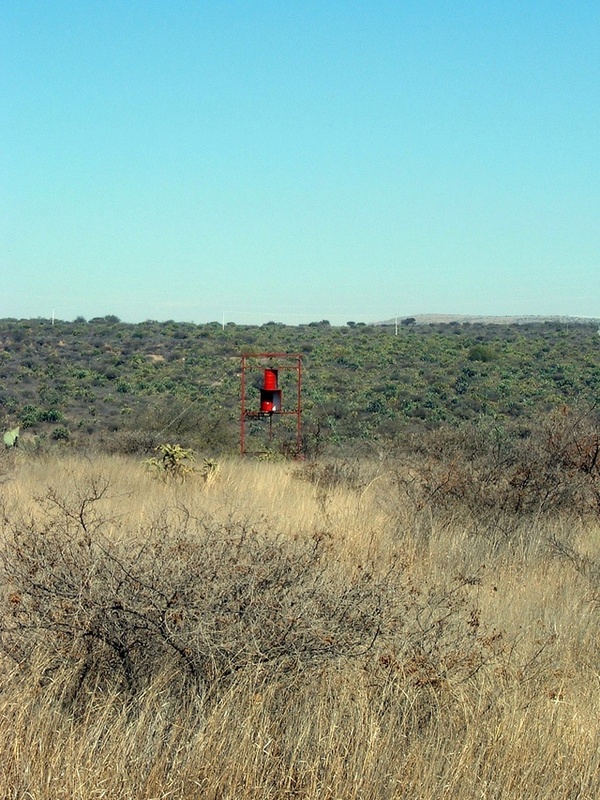 At the botanical garden, El Charco del Indigenous, for example, there was a windmill made from two 55-gallon drums, sliced in half top to bottom joined at inside to outer edges around a central pole making a two-sided half drum on each side of the central pole to catch the wind. Two of these severed drums combined spinned to make a fast-turning windmill that drew water from the lagoon, a quarter mile away, up to the conservatory for use in irrigating plants in the nursery. Went out today to explore the city a bit, trying to get oriented. I did not stop in, but I found, the Allende Institute, explored the San Antonio neighborhood a little. The different residential areas are called 'colonials' and I was assured by a woman walking along the street that San Antonio would be a good place to look for housing in my price range and another man at the Internet cafe, Cafe del Sol, gave me the name and address of a man who has several apartments and with whom this man rented when he first arrived—16 years ago. I hope the landlord is still alive. I'll walk over there tomorrow and try to make contact. The Cafe del Sol today was the site of my second meal in a restaurant. I ordered enchiladas with mole sauce. It was very good, as was my Soupa Azteca the day before, but I think the mole sauce, with it's base of chocolate was a poor choice. I could have had red or verde sauce instead. A better choice would have been the salsa verde made, I suppose, with tomatillos. Along with the meal I ordered jugo verde, a vegetable juice made with celery, parsley, other green veggies I can't remember and lime. It was very refreshing. I don't remember exactly the ingredients for mole sauce, but I think it's made of a paste of chile peppers, several kinds, garlic, tomato and chocolate. Mexican chocolate of course is not as refined, nor as fatty, as chocolate eaten in the North as candy, or used for baking. The dish I had today was garnished with sesame seeds, a nice touch, which I learned later talking with a neighbor in the campground is typical in Mexico. Sesame & chocolate: think about it. An appealing combination, but not one seen, at least not in my experience, in the North. The highlight of the day was the pu,blic market on top of the mountain on the opposite side of the city. It'skn own as the Tuesday market—for obvious reasons --and was a wonderful experience both for the few things I bought there, and for the local color. As usual the Mexicans were good natured about my ignorance and poor Spanish. The food stands had all kinds of fruit and vegetables, dried beans, nuts, tortillas and spices. Then too there were plastic cartoon characters for sale, CDs, and clothing. I did not see any stands selling tube socks like in Rochester's public market. Maybe it's trend that's not yet reached Mexico. There were all kinds of meats, chicken, fish, fresh and cooked. The stands selling carnitas were crowded 3 & 4 deep with locals buying chopped pork, skin, fat and meat. One stand sold made- to- order quesidillas more like a rustic pizza than the fancy tortilla sandwiches I used to make. That stand was also popular surrounded with eager customers. Lots of locals seemed to come to the market just to eat. I bought only two small avocados, ripe, for 50 cents, a tangerine the size of a grapefruit for ten cents—the woman called it a mandarino, some Spanish peanuts in the shell, and a mango and some cumin seeds. My first shopping expedition in el mercado set me back about two dollars all tolled. . I would have paid much more just for the pleasure of seeing all I did. Except for the caged songbirds, which I did not see but was later told were there for sale. I'm not surprised, but disappointed. Later in the International Edition of the Miami Herald I read about an animal rights group that interrupted a bull fight somewhere else in Mexico. I have to admit that when I first saw tSan Miguel's bull fight stadium Plaza de Toros on the road to the market I was put off by it, bunny-hugger that I am. I've read that the Plaza de Toros accommodates 3,500 spectators, is often sold out, and seats in the sun and seats in the shade are priced differently. An afternoon's program will include 4-6 bullfights, each one comprised of three stages. First the picadores circle the bull jabbing it with lances in the shoulders, then the bull is targeted by running fighters called banderilleros with large quill-kind of knives meant to stick in the bull's hide and make it bleed. Then, in the third and final stage the matador comes out and tries to impress the crowd with his daring play with the wounded, bleeding animal. The finish comes only when the exhausted animal, about to collapse from loss of blood, is killed, one hopes, in a single coup de grace thrust of the matador's sword to the heart. The matador gets bonus points if he gets it right the first time. Meat from the bulls is given to the poor, orphans, or something warm and fuzzy like that. I'm beginning to understand the lure of San Miguel. It's beauty is at times breathtaking. The campsite where I'm based is in what is known as the East Hills, a more affluent and expensive part of the out-lying city. Imagine a steep-sided bowl with the city center in the middle. On all sides, further up the mountain sides surrounding the city are pastel-colored houses, and neighborhoods with shops and services not unlike any city in America. The most impressive difference in my experience so far is that the houses are gold, pink, sometimes white, reflecting bright sunshine, red tile roofs dotting each not unlike Tuscany of which this place very much reminds me. The beauty at times is just staggering. Views are n. The is great wealth here, mostly American, Canadian and European, and great poverty. It seems like every Anglo I meet has something to say about how expensive San Miguel has become. A woman I met today walking down the hill as I was driving up told me how she'd been here twenty years—from Washington state, near Vancouver and lived since on $500 a month. She made the point that she could only survive because she built her own house. She was encouraging to me and gave me some pointers about finding housing: Look in the East Hills, where neighborhoods are less expensive. I plan to explore those places tomorrow. It's been a holiday weekend, today, Feb. 5 is “Constitution Day” but Monday will be a holiday too with banks, the library and I suppose government offices and businesses closed. I'm eager to get into La Biblioteca, where Anglos post notices about apartments and houses to rent. I've read that it has the second largest collection of English language books in Mexico. They also have Spanish language classes, a cinemateca, theatre and organize other civic activities. I'm looking forward to 'joining', one pays 120 pesos (about $12) 'deposit”and then 50 pesos per year for membership. I tried today to buy a cell-phone. It's not going to be cheap. International calls are very expensive—something like 50 USD for 60 minutes. I am going to try to use Skype which makes calls over the Internet. Or public phones using calling cards. I read yesterday that Mexico is phasing out public phones in face of wide use of cell phones. Email is still the most cost effective way to communicate. At least for the time being. I did my first shopping today in the Gigante! It's only one of several high end supermarkets selling food, household goods, wine, liquor, small appliances, and –best of all—dog food. It's very convenient to the campsite, just a short drive down the road. On the way we stopped at a large lagoon created by a dam and Riley has a swim. He retrieved the ball as many times as it took to tire him out and then we watch as a man and his two children watered and washed their horse. Clearly many water their livestock there because the rocky edge of the water was littered with cow and horse droppings. I was kept busy preventing Riley from taking a post-swim roll in manure.